No-one is going to forget 2003 in a hurry. We won 9 away league matches on our way to a glorious title triumph, and while it was very much a team effort, there is no doubt that the mighty Frede Schott did a great deal of the strong-arm stuff. It was Frede's ultimate season - he had the vision, that he wanted to top the averages and lift the team to the title. And he achieved everything he could possibly have wanted in spite of that broken collar-bone in mid season. He was so positive, he just wouldn't let anyone stop him, and the encouragement he gave all his team mates was clear for all to see. 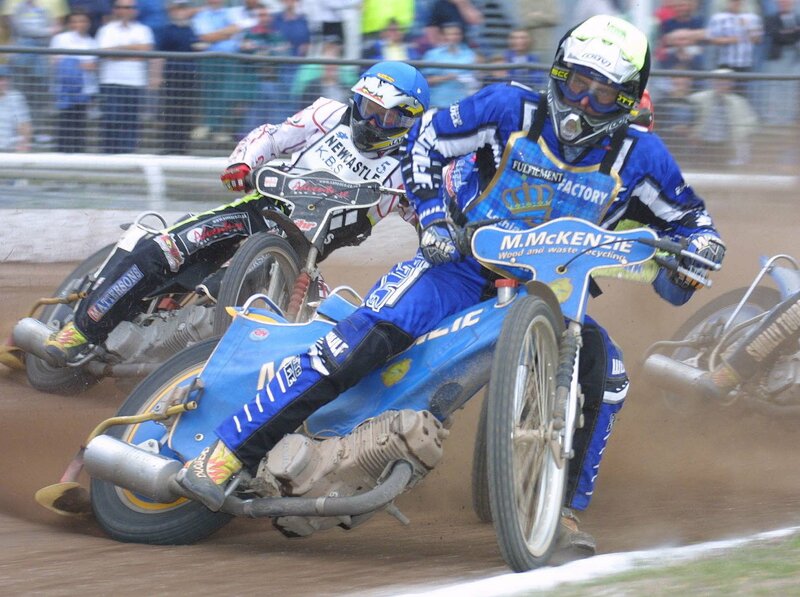 This fine action shot by Steve Brock shows one of the year's key heats, the last heat decider at Newcastle on 1st June. We led by two going into the race and saw Frede and Peter take a winning 4-2 over Kenneth Bjerre and Stuart Robson.